Everyone who is having an online appearance knows about Google Ads or Google PPC. These are the ads which gets displayed on Top, Right and Bottom of search result pages. Google has always been doing search result algorithm updates but this time, Google has modified their AD ranking algorithm – which defines whose ad should be displayed at top. Previously, AD algorithms were based on 2 components: Max CPC Bid (the most an advertised is willing to pay per click) and Quality Score (Google’s assessment to your Ad, Keywords and landing page quality). With the recent algorithm update, a their component is added to define the ad position, which is Ad Extension. 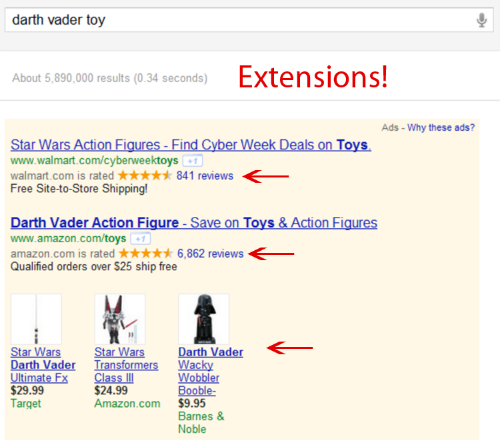 From now on, Ad Extensions will define who’s Ad is to be displayed above the others (whenever two ads are closed winners to be displayed on search result page). As per Google states for Ad Extension, ‘the expected impact from your ad extensions and formats’ is what defines the ad ranking. These Ad Extensions will be helpful for viewers as this will also let advertisers to provide additional information about their business such as address, phone no or even a promotional code.